Finally out this week, this is a massive tune from Erick Morillo’s always reliable Subliminal Records. With a radio and US Mixshow edit included on the promo for those who like their tracks short, the mixes that we’re concentrating on are the Original, Club, Dub, Instrumental and Tim Anderson Remix. The Club Mix goes for the big beats and huge breakdown, which allow the vocal to stand out and build through effects before unleashing the beats again. The Instrumental, as you would expect, does the same without the vocals! The Dub Mix takes focus on its tough beats and sythns, definitely playable for those who are not too keen on vocals. 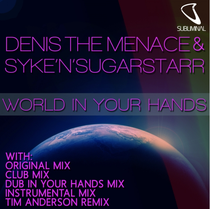 The Original mix concentrates on the beat, before breaking down into the emotional track and the catchy hook of ‘world in your hands’ – you can almost picture the lighting show that should accompany it! Finally, Tim Anderson’s remix introduces the track slowly and atmospherically, before smashing you with a wallop with its angry synths. Brilliant! Big tune this one!